Looking for a way to get your little minds working at the start of the day? 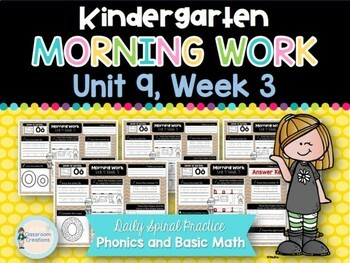 This print and go morning work packet is a targeted way to expose your class to weekly phonics and basic math concepts. They have the chance to practice writing and using the targeted skills each day to reinforce their learning. This resource follows the Kindergarten Reading Wonders phonics and sight word progression, but could be used in any kindergarten classroom, as it is made to be a stand alone resource.